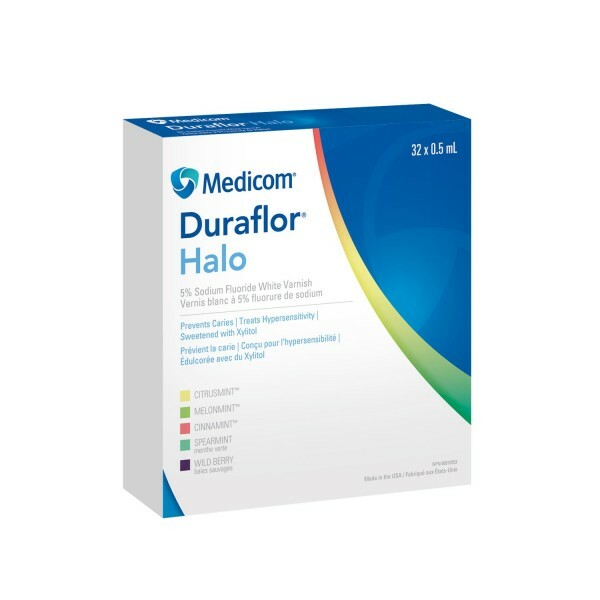 Lead the fight against caries and treat hypersensitive teeth with Medicom Duraflor Halo 5% White Sodium Fluoride Varnish. This fluoride application dries to a natural white colour to ensure patient compliance and provides the highest allowable fluoride concentration for the ideal solution to prevent and protect against cavities. Sweetened with Xylitol, patients will enjoy each of the 5 great tasting flavours. Duraflor Halo is free of gluten, tree nuts, peanuts, sesame, corn, shellfish, penicillin, egg, soy and dairy products.